Thread: Is the Malware that infected this computer completely gone? My father's PC was infected by the protect.exe virus and I want to make sure it is now running correctly and there is no other sign of malicious software on it any more. Can you analyze the HiJackThis log for us? Thanks so much! R0 - HKLM\Software\Microsoft\Internet Explorer\Search,SearchAssistant = Internet Explorer 6 Search Companion is no longer supported. c:\documents and settings\jack mills\my documents\downloads\explorer.exe (Heuristics.Reserved.Word.Exploit) -> No action taken. One specific question I have is whether my Dad's anti-virus software is still running correctly. As the trojan found on the system was mimicking Microsoft's virus program, I am not sure if the actual program is still good or whether it has been compromised. The system was set up with Microsoft Security Essentials which I have not used before. I don't know if it is running correctly or if it has been updated regularly. Again, thanks for your help in diagnosing these logs. I've run both DSS and the GMER scans on my father's computer and am attaching the log files here. Can you let me know if everything looks okay with these logs or whether there is any sign of viruses, worms or spyware on his computer? I have bad news. your fathers computer is currently still infected. The good news is we can get it cleaned up. Here are the files that have been created with TDSSKILLER (inline since it wasn't a txt file) and COMBOFIX. The computer seems to be running okay now. My dad's system has lots of applications that start during startup, and they seem to have all restarted okay. I've reenabled the AV and Malwarebytes protection. There are still alot of leftovers on the machine. I've run the final scans you discussed in the previous post. The logs are attached to this post. The system seems to come up faster than it did before and it seems to be working better. 1) The ComboFix executable said there was a newer version, so I downloaded the new version and used that to run the ComboFix script. 2) I had already downloaded (and my Dad purchased) a copy of MalWareBytes earlier this month so it gets the latest upgrades daily. I used this copy to run the MalWareBytes scan. 3) I had his backup harddrive connected to the PC while running ESET and it found 2 threats in the backups which I deleted. Do you recommend using ESET for a AV? My Dad's computer is currently running Microsoft Security Essentials (with MalWareBytes and SuperAntiSpyware), but it looks like ESET gives more powerful coverage. Is it compatable with MalWareBytes and SuperAntiSpyware? Again, thank you very, very much for your help! Microsoft Security Essentials is a good program. Just remember the is no one cure all Antivirus out there. If there was there wouldn't be so many. Important Note: Your version of Java is out of date. Older versions have vulnerabilities that malicious sites can use to exploit and infect your system. Download the latest version of Java Runtime Environment (JRE) Version 7 and save it to your desktop. Look for "Java Platform, Standard Edition". From the list, select your OS and Platform (32-bit or 64-bit). If a download for an Offline Installation is available, it is recommended to choose that and save the file to your desktop. Go to > Control Panel, double-click on Add/Remove Programs or Programs and Features in Vista/Windows 7 and remove all older versions of Java. Then from your desktop double-click on jre-7-windows-i586.exe to install the newest version. If using Windows 7 or Vista and the installer refuses to launch due to insufficient user permissions, then Run As Administrator. When the Java Setup - Welcome window opens, click the Install > button. If offered to install a Toolbar, just uncheck the box before continuing unless you want it. The McAfee Security Scan Plus tool is installed by default unless you uncheck the McAfee installation box when updating Java. Note: The Java Quick Starter (JQS.exe) adds a service to improve the initial startup time of Java applets and applications but it's not necessary. Go to Start > Control Panel > Java > Advanced > Miscellaneous and uncheck the box for Java Quick Starter. 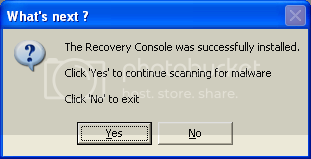 Click Ok and reboot your computer. Thank you! Your help in deciphering the logs has been a tremendous help to me and my Dad. We are truly grateful.